I set my alarm for 2:05am to prepare for the cruise ship’s entry into Suez Canal. When the alarm rang, I shut it off and dozed a little. A little of snooze turned into 3:34am. Thinking that I might have missed the entry, I put on something warm to go out and see which part of the canal we were at. Turns out, it was still really dark and we were still in the Gulf of Suez. It wasn’t until 6:00am that the ship started driving toward the canal entrance. By that time, I was bored out of my brains. After the entrance, I went back to my room at 7:00am to rest a little. Same as in the morning, “a little” turned into 11:00am. Gulp! I had lunch at the Windjammer Cafe which had a view of the canal. Then I headed upstairs to the open deck to take photos of the canal. The canal was a pretty blue green when we sailed on it. Beside the blue, we had plenty of sand. Landmarks which we passed include the Egypt-Japan Friendship Bridge. The pillars are obelisk-shaped which I thought was a nice touch. The journey through the canal was quite long. It took 9 hours for us to finally cross from south to north. 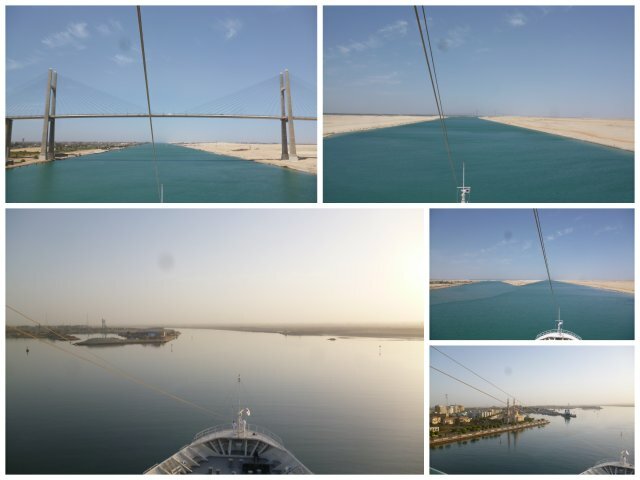 While the ship sailed through the canal, I managed to go online on my laptop by using the Egyptian mobile data. I felt rather smug when the other passengers asked me if I was using the ship’s Wi-Fi.